Our jam adventure continues, this time with fig jam made with fresh figs from a tree behind my parents house in Memphis. I love the fig spread that I get at the grocery store but it is pretty expensive. Well, I think this homemade version is even better. I really like fig jam on a turkey or chicken sandwich. I had a really hard time finding a fig jam recipe that didn't require 3+ hours of cooking. 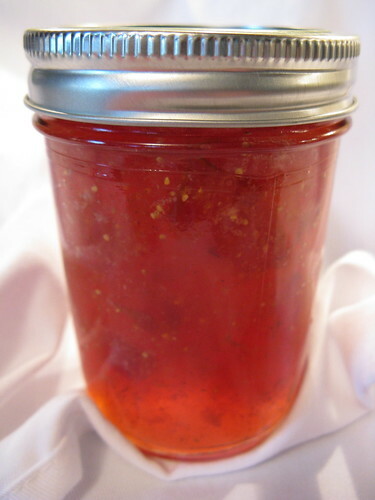 I finally found basic guideline here & used them as well as the directions on the of pectin. I thought of a couple different options for added flavor, citrus, honey, ginger but finally decided on cinnamon. The flavor of the cinnamon is recognizable in this jam but not in the least bit overpowering. The jam set up beautifully & has a gorgeous color. This maybe my favorite flavor we've made so far. Prepare the jars & lids for canning. Jars should be boiled in water for 20 minutes & lids for 5 minutes. In a large enamel or stainless steel saucepan combine the figs, water, lemon juice and cinnamon. Whisk in the pectin until completely dissolved. Turn heat to high & bring to a boil (it should not stop boiling when stirred). Stir in the sugar all at once. Return to a boil. Boil hard while stirring for 1 more minute. Remove from heat & skim of foam. Ladle into eight hot sterilized half-pint jars leaving about 1/4-inch headroom. Clean off the tops of the jars & cover with a lid. Close with a neckband & finger-tighten. Process in boiling water for 10 minutes. Turn off heat & let sit for 5 minutes. Remove jars from the water to a heat-proof surface & let cool for 12 - 24 hours (do not dry jars). Check to make sure the top of the jar has been drawn downwards, creating a seal. If it hasn't either reprocess that jar or store it in the fridge to be eaten within 3 weeks. Remove the neckbands & store jam in a cool dark place. Oh, that's just beautiful! I would so take a big spoon to this jam. The color is indeed lovely, a kind of reddish-orange; is that strictly from the fruit? And do the figs have to be peeled or anything beforehand? Questions galore from someone who has never had a fresh fig before! The color is strictly from the figs. Different figs would probably make for a different color. I did not peel my figs because they had very soft skins. You can peel them if you have tougher skins or put them in boiling water for 5 - 10 minutes. Oh yeah! My kind of jam! This looks like such a treat. I love fig jam with savory things. Wow! Gorgeous!! I haven't gotten up the guts to try canning anything after my strawberry jam attempt....I'll have to try again soon! this seems like the kind of preserved fruit that i wouldn't mind just eating by the spoonful. note to self--buy figs. I dont' think I've ever had fig jam. But then again, I've never had a fresh fig, either! I have just made two batches of fig jam. The first I have ever made. I cut down on the sugar dramatically. The first batch I used 1 cup Splenda since we have diabetics Type 2 in the house. This was too sweet. The next I used 3/4 cup. Just right. I grow our own figs, Desert King on a south facing wall. The figs I use are tree ripe. And I mean ripe. I think that the recipe you have is OK except you don't use ripe fruit. I use 1/4 cup water instead of 1/2. Rest of recipe is the same. David Lanning. From Pacific NW. David - I'm not sure how you can assume I'm not using rip fruit. The figs I were using were very ripe and oozing their "honey." 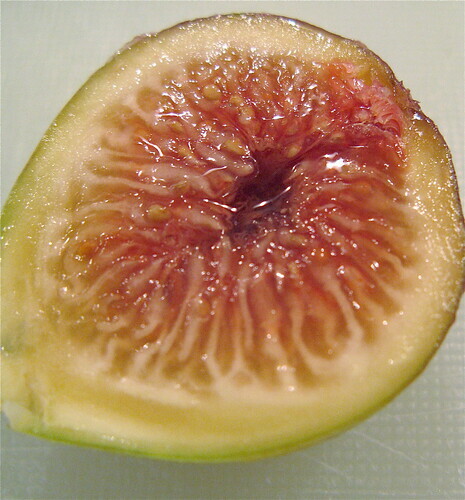 If you are going by looks, keep in mind there are different kinds of figs & mine ripe might look different than yours.